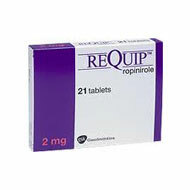 Requip (Ropinirole) is used to treat Parkinson's disease. This medication is used to treat Parkinson's disease. It helps replace the brain chemical called dopamine, which is low in Parkinson's disease. It is also used to treat RLS (Restless Legs Syndrome). Take this medication as prescribed. Do not increase your dose or take it more often than directed. Do not stop taking this medication without your doctor's approval. Stopping this drug suddenly may cause you to experience unwanted side effects. Dosing is based on your condition and this drug's side effects. It may take a few weeks for this medication to take effect. Requip helps relieve the signs and symptoms of Parkinson's disease. Caused by a deficit of dopamine (one of the brain's chief chemical messengers), this disorder is marked by progressive muscle stiffness, tremor, and fatigue. Requip works by stimulating dopamine receptors in the brain, thus promoting better, easier movement. If you miss a dose, take it as soon as remembered; do not take if it is almost time for the next dose. Instead, skip the missed dose and resume your usual dosing schedule. Do not "double-up" the doses. Store at controlled room temperature away from moisture and sunlight. Do not store in the bathroom. Tell your doctor if you have a history of: heart disease or heart arrhythmias (abnormal rhythms), hallucinations, mental confusion, difficulty walking, any allergies, kidney problems, liver disease, low blood pressure. To avoid dizziness and lightheadedness when rising from a seated or lying position, get up slowly. Use caution when performing tasks requiring mental alertness such as driving or using machinery. Limit alcohol use because it may intensify the drowsiness and dizziness effects of this drug. This drug should be used only when clearly needed during pregnancy. Discuss the risks and benefits with your doctor. It is not known if this medication is excreted into breast milk. Consult your doctor before breast-feeding.